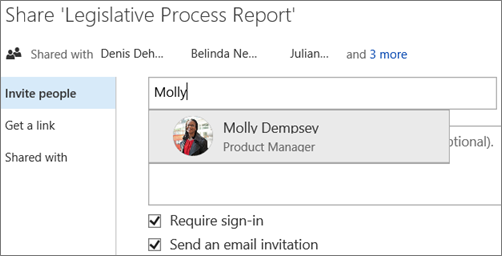 The files you store on a SharePoint site are usually available to everyone with permissions to the site, but you may want to share specific files or folders with people who don't otherwise have access to the site. When you share files and folders, you can decide whether to let people edit or just view them. 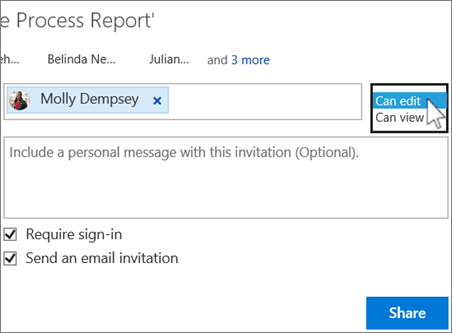 Important: If you're sharing OneDrive for Business files, see Share OneDrive files and folders. 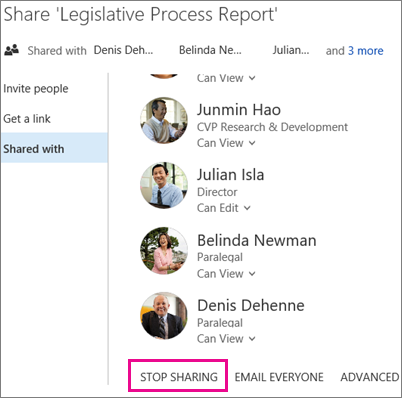 This article focuses on sharing files that are stored on SharePoint sites. 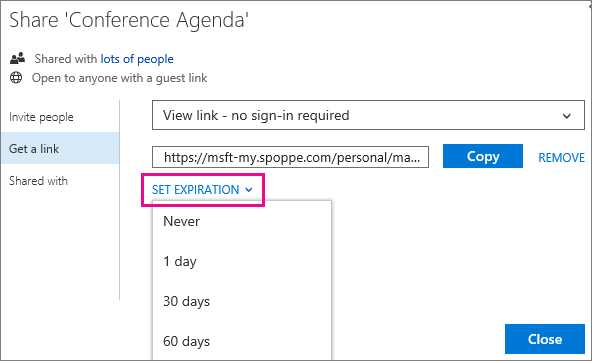 You may also be able share files with external users (people not on your network) by inviting them as “Guests,” or by creating and posting guest links. For details, see Share sites or documents with people outside your organization. Go to the site library that has the file you want to share. 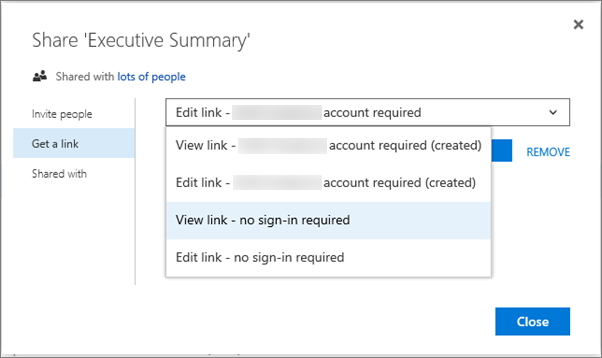 Notes: If you see only a restricted link option instead of the options shown here, sharing links may be disabled or you may not have permission to use them. For information about how an admin can enable sharing, see Video: Share a site without access request. Go to the site library that has the file or folder you want to share. 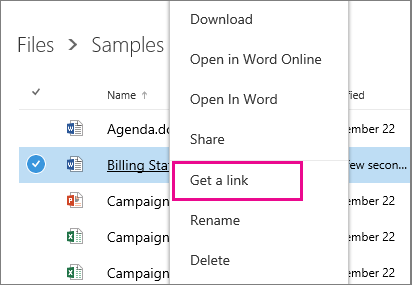 Right-click the file or folder and then click Share. 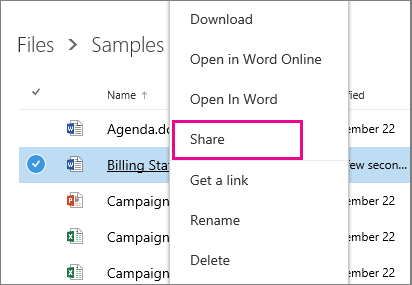 Tip: If the library you're working in has a Sharing column, you can select the people icon to open the Share dialog box. 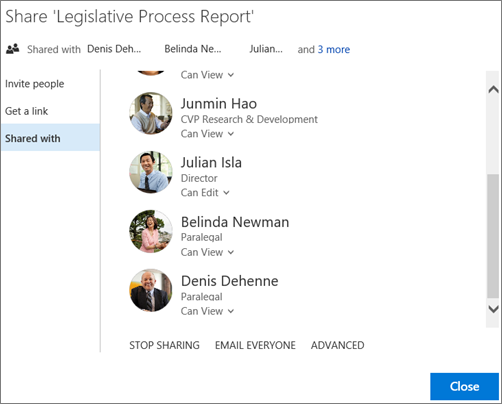 On the Shared with tab in the Share dialog box, select STOP SHARING below the list of people you're sharing with. Important: The STOP SHARING link that removes all users at once is not available for folders. To quickly stop sharing a folder with many users or groups, try this: Click ADVANCED, use the check boxes to select the users or groups you want to remove, and then click Remove User Permissions.